Send a cool and classic hand-stamped card to Thank someone from the bottom of your heart! Here with cool greys, stunning silver foil, textured embossing and a dash of sparkle you can deliver an elegant card that is sure to WOW! With a twist of the handle, use the Big Shot Die-Cutting/Embossing Machine to leave a cool impression!! See how here and leave me a comment on what YOU do with your hand-stamped, embossed thank you cards! Going for elegance while remaining cool is easy with this awesome From My Heart stamp set!! With coordinating Labels Collection Framelits you can die-cut around each image for a WOW accent that is easy to do. This stamp set is classically beautiful while still staying on trend in style. 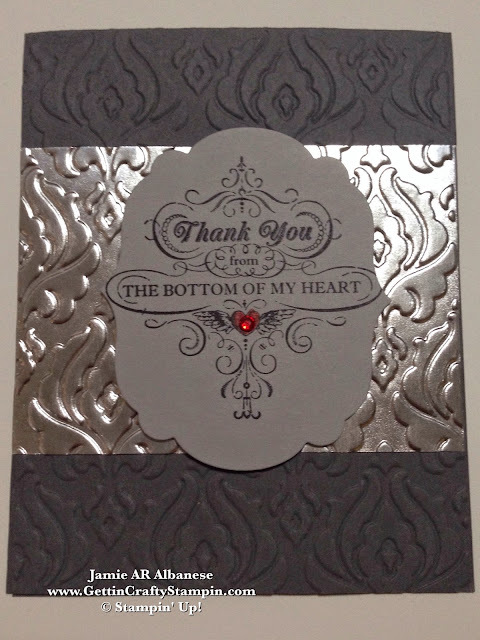 Stamp the 'Thank You from the Bottom of My Heart' sentiment on the Smoky Slate card stock in Jet Black Stazon ink (I love the smell of the Stazon Ink... sigh - lol). Lay it between the Cutting Pads on the Magnetic Platform with the Label Collection framelit that fits perfectly around it. It's just that easy to WOW with a Die-Cut that is perfectly cut! 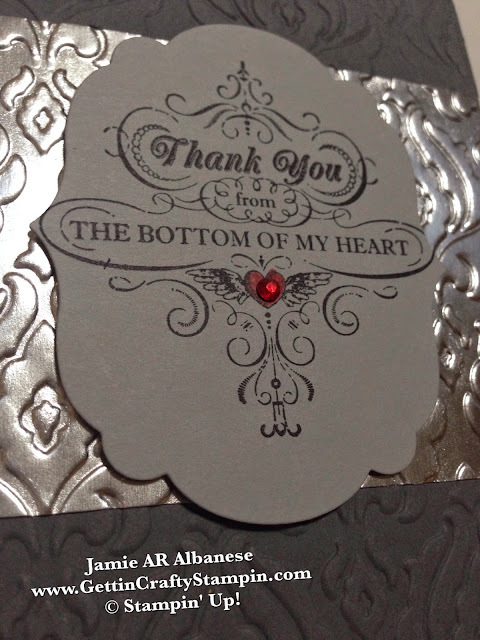 Adhere it to the card using the Stampin' Dimensional Adhesive - it will help your card to rise above the rest. Tool Tip Tuesday: The SECRET to using our stunning Framelits is using the awesome Magnetic Platform for the Big Shot!! YES!! I LOVE, Love, love the Magnetic Platform!! Lay your stamped image on the Standard Cutting Pads while they lay on the Magnetic Platform. The Magnetic Platform will hold the metal Framelits through the cutting pads and in the exact place you need. No more using sticky notes or tape to hold down the Framelits on the exactly location that you need, the Magnetic Platform will do ALL the work for you - leaving you to roll the handle and deliver WOW crafts! Embossing, it's a simple way to make a BIG Impression (lol). Seriously - with our Silver Foil Sheet adhered with SNAIL to the Basic Grey card stock you can impress with an elegant embossed surface. Using the Standard Multipurpose Platform (that comes with the Big Shot) and Standard Cutting Pads you can emboss the Silver Foil and the Basic Grey card stock together for a WOW look and feel. Color the heart and adhesive backed Rhinestone Jewels with a permanent marker for a colored sparkle that will pop on this card. Thank someone from the bottom of your heart with this Silver Foil, Embossed, Die-Cut hand-stamped card that is easy and fun to create! With a 'cherry' like topping the red jewel and heart really do lend for a stunning accent. Thanks to my Big Shot Die-Cutting and Embossing Machine I can deliver a stunning card that wow's with a twist of a handle!! How will you thank those who leave an impression on you?? Let me know by leaving me a comment!